We at Trudeau Yachts are always looking for the next inspiration. This one came from within Second Life itself. It turns out a close SL friend of Jacqueline Trudeau works in the fashion industry. Within that industry he is a designer of women’s handbags and other leather goods. Within that job description he reports to those at the top of the fashion houses where he works. For a time the very top of this particular fashion house was Yves Carcelle, a well respected executive and by all accounts well loved within the organization he headed. But business and fashion was not the only thing Monsieur Carcelle lived for. His passion was sailing, and in particular the sailboats of Danish designer Gerhard Rønne (1879-1955). Rønne was a building architect, but also a passionate yachtsman who designed and oversaw the building of 10 yachts (6 for himself) beginning in 1910, all christened Runa (from I to X). Fast forward a century later to 2009. 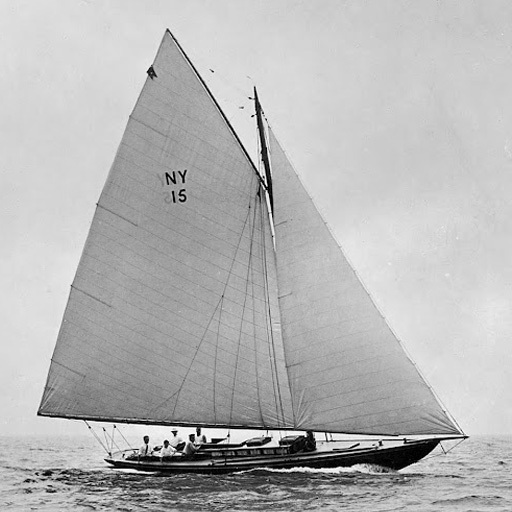 Carcelle, with his keen eye for classic beauty, acquired two of the five extant Runa yachts, the yawl Runa IV (1918) and cutter Runa VI (1927). He commissioned beautiful stem to stern restorations of both and were relaunched in 2011 and 2013 respectively. Monsieur Carcelle actively participated both restored Runas in classic yachting regattas, but sadly about this time he was diagnosed with a particularly aggressive form of cancer which took his life in 2014. One of his last acts was the commissioning of the book La Saga des Runa, a history of the Runas and an ode to all things Gerhard Rønne. This brings us back to Jacqueline’s SL friend. As mentioned, he was one of Carcelle’s lieutenants, a sailing enthusiast himself and a personal eyewitness to Carcelle’s fleet of Runa yachts. 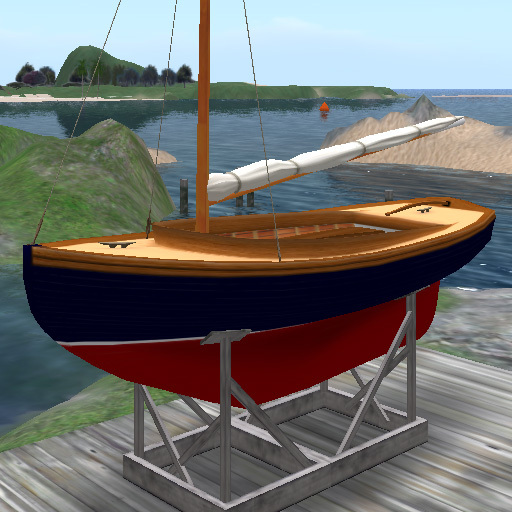 “Jacqueline, il faut construire Runa!” One quick google of the boats and it was absolutely agreed. But which one? 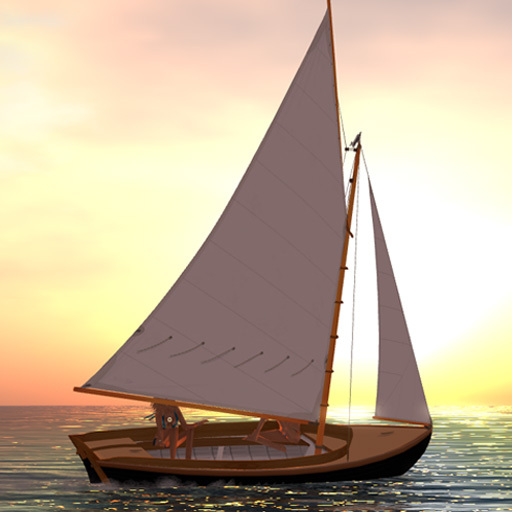 Since we hadn’t done a multi-masted mesh yacht yet, it had to be the topsail yawl Runa IV. Working from the Runa plans, it didn’t take long to get the basics in place. 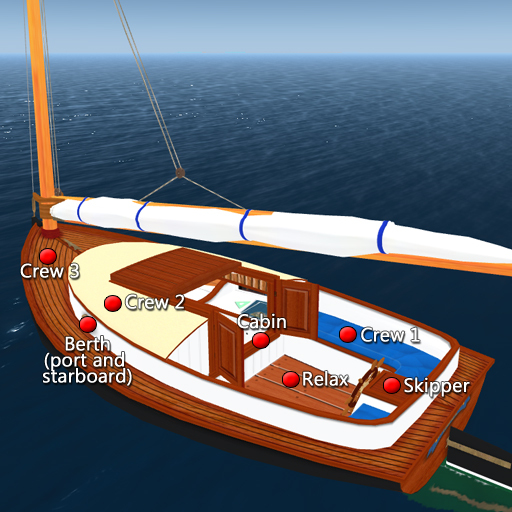 Underway, there are seating positions for skipper and 2 crewpersons – 1 heel-offsetting hike position per side for the skipper, 3 per side for each crewperson. 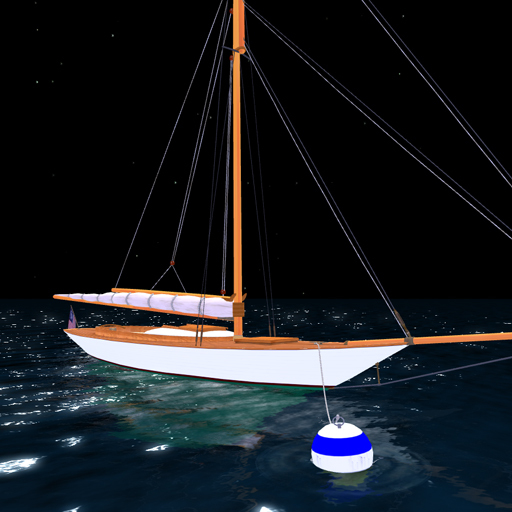 Our should-have-been patented in-world luffing Tru-Sails. 1 reefing setting (douses the jib and main topsail). 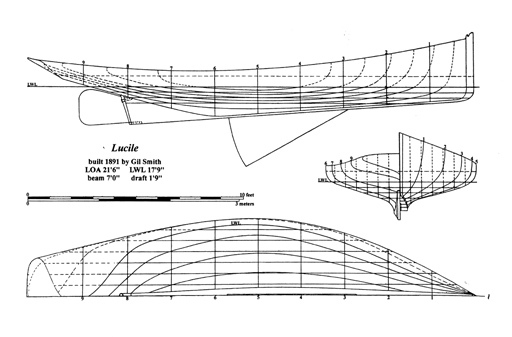 Wing and wing foresails for additional oomph when running before the wind. Auto-rezzing boatyard jack stands (28LI). 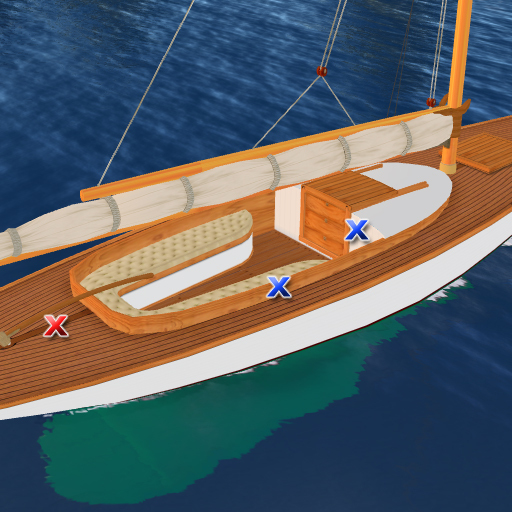 Trudeau Runa IV – 85 prim equivalent , 51.66 ft (15.75m) length on deck, 75.85 ft (23.12M) length overall, 12.13ft (3.7m) beam, 7.5ft (2.3m) draft. 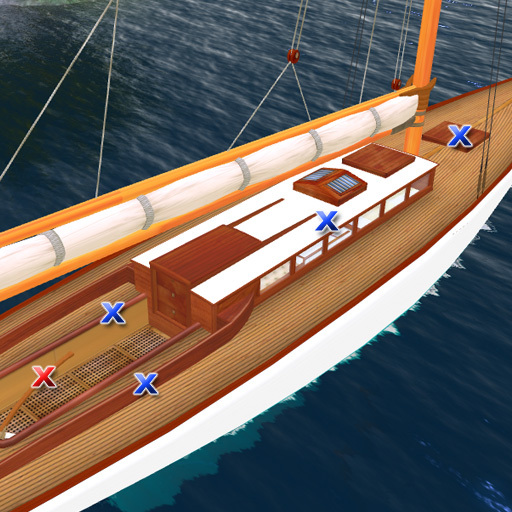 85 land impact moored, max 95 land impact when sailing. Come view her at Trudeau Classic Sailing Yachts and see if you are ready for a sail into the mystic. 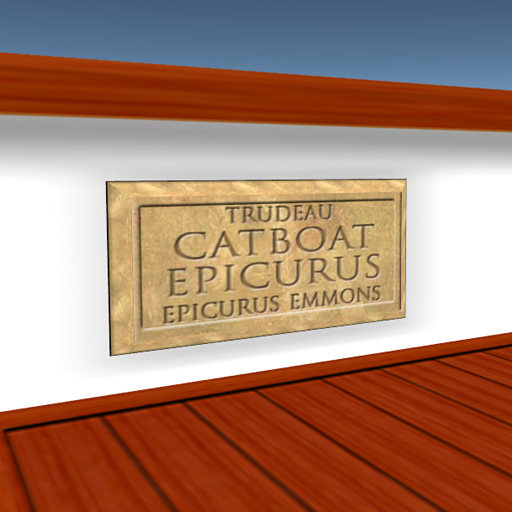 The latest Trudeau is tribute named after the beloved and esteemed figure in the community and Commodore of the Fishers Island Yacht Club, Epicurus Emmons, who very sadly passed away earlier this year. Epi was a fixture on the SL sailing scene organizing regattas, cruises, events and a tireless help to all he came in contact with. He had a huge, brave heart and we were honored to have known him and call him friend. Though not European in origin like Epi’s cherished skûtsje, a tribute from a boat like this is not as odd as it might seem. Epi was a instrumental in bringing out an earlier Trudeau catboat – the Leetle Cat – giving us much needed advice on performance and handling. Both boats, the Cape Cod Catboat and the Frisian Skûtsje (originally common workboats now live on fitted out as traditionally-themed yachts and yes, racers) sport gaff rigs and strong, distinctive sheers. The catboat is a native American art form – plumb stem, wide beam, mast in the eyes, gaff rig, big barn-door rudder, single head-stay. 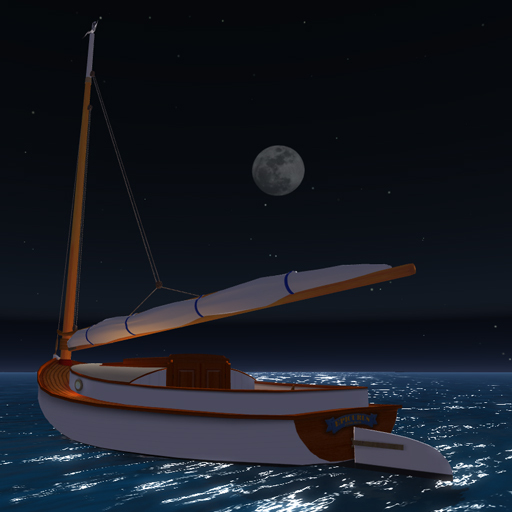 The catboat – a little boat, a useful boat, a handy boat, simply rigged and simple to operate; a mast and a sail, a tiller and a cabin for two — there was a time when most small boats were rigged as cats. 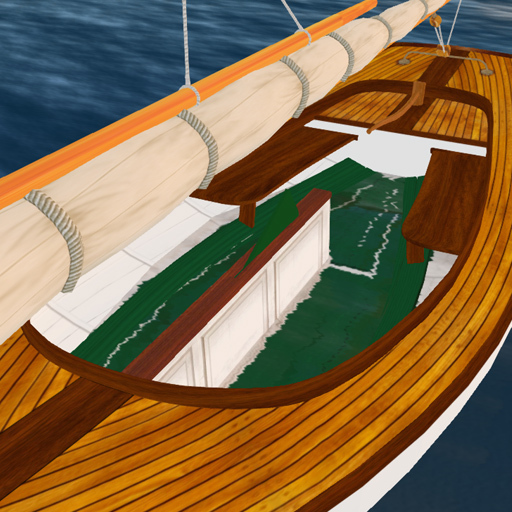 As with all the “new” Trudeaus, the Epi has the inworld “TruSail” luffing sails, moveable skipper and crew positions to counteract the heeling forces (Epi carries skipper and crew/passenger complement of 3) and the first that offers a snug cabin with sleeping berth for a couple. The Epicurus is the perfect boat for you and your partner to set sail in for those overnight and weekend SL cruises. 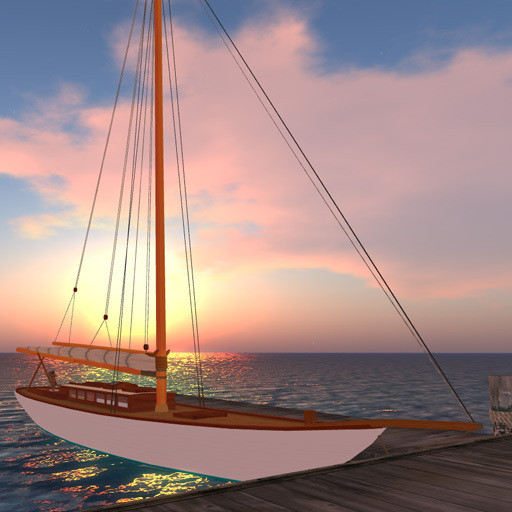 Swap your bathers for sweaters and set your windlight to foggy – just the right romantic touch for a boat like this. 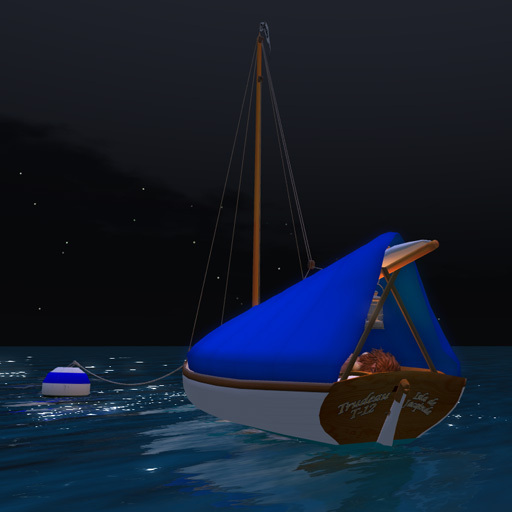 Find that no-return parcel (hopefully in a picturesque cove), switch on the cabin lights, snuggle in for the evening and continue your cruise the next morning. ;) If you do get caught in a tight spot, there is a motor under the cockpit sole (including the requested reverse gear). Get with it, daddios. Hep is hipper than hip. It’s in the pocket. It’s straight from the fridge. It’s copacetic. It’s the new Trudeau HepCat, our Son of a Beach(cat). Reap this righteous riff, this is one crazy SOB. Hang the hell on to something! Flat ain’t where it’s at. HepCat’s sails, more curves than a Jayne Mansfield film fest. Bunnie Mills, Trudeau sail boss, is one wrascally wrabbit! The tramp is no lady. Nor is it a bindle-stiff. It’s a stage for skipper and crew to make sweet music upon, so blow, Roy, blow. Or play it solo. 4 positions per side. Hiking straps. Keep cool though, too much bouncing around on this tramp will upset HepCat’s balance with clinkers and put the kibosh on your speed. No kick from champagne. But plenty of kick from these rudders – HepCat turns on a dime. 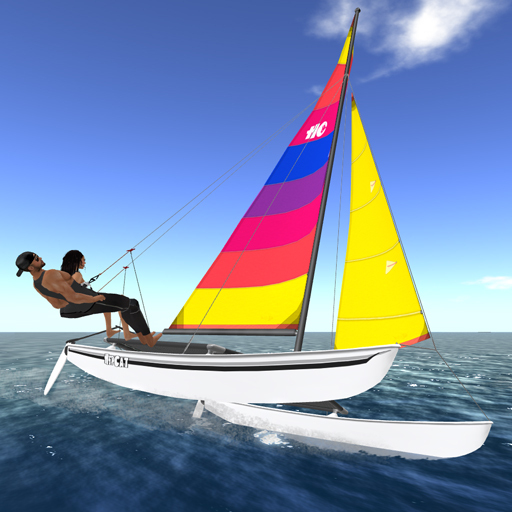 And a kick up… handy for sailing up on the beach, over ramps and other screwy exhibitions. Down… they can be a real drag, man. Up… not so much. Not much help in steering either. But don’t sweat it, you’ll be the wiser in no time. Circus act. We don’t dig jive clowns. But a high wire? Solid. HepCat has trapezes for all you daring young men (and women). If they asked if you were moving, tell them you were flyin’! Wig out. Or as the L7s call it, capsize. Hot dog it too much and you’ll get the bum’s rush into the drink. Don’t have a kitten though, moor HepCat and you’ll be sittin’ pretty again in no time. 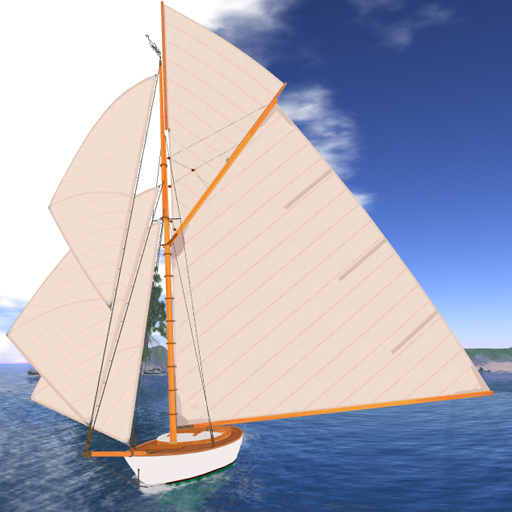 HepCat is lousy with sail choices. And for you egghead longhairs, all of them historically correct. Beach Cat Beach has gone Hep. Make the scene and dig the righteous Cats (cut a demo too!). That’s the rap. Don’t be a chump, get Hep. The Third Time. A Charm? 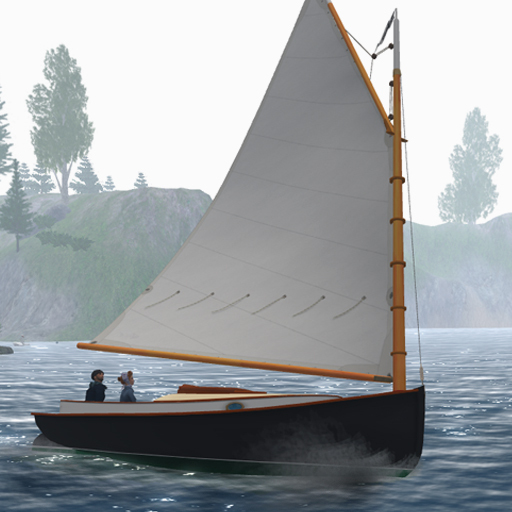 We at Trudeau are huge fans of the boats of the Herreshoff family. If it seems like every other boat that comes from our yard is in some way a tribute to either Captain Nat or his son L. Francis’ work, it’s probably because it is. 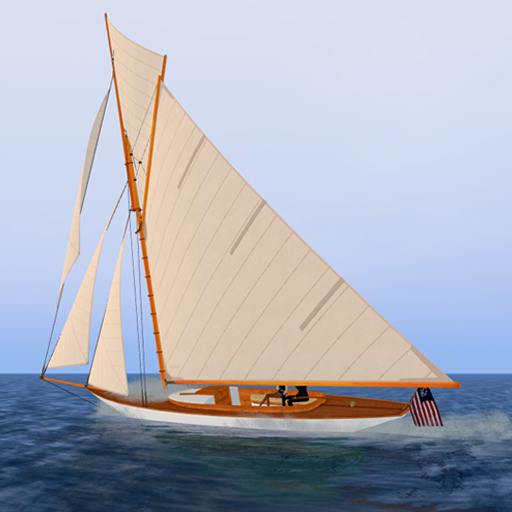 Of course, the one design that is most approachable, perhaps the most endearing and enduring is Nathanael’s 12 1/2 daysailer. 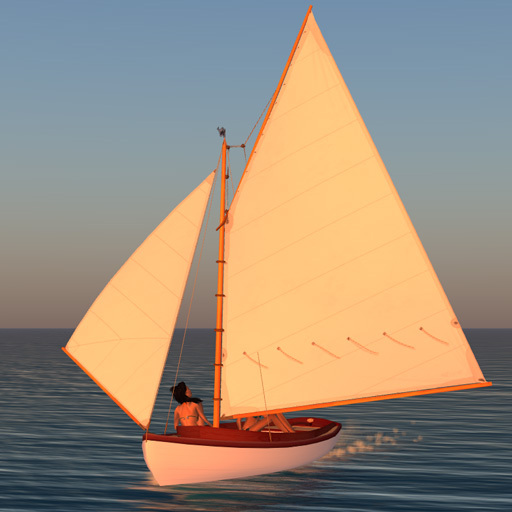 We are in love with that boat and have tried to model it from the earliest days of TCSY (read our rhapsodic praise and historical tidbits about the real life H12 here). 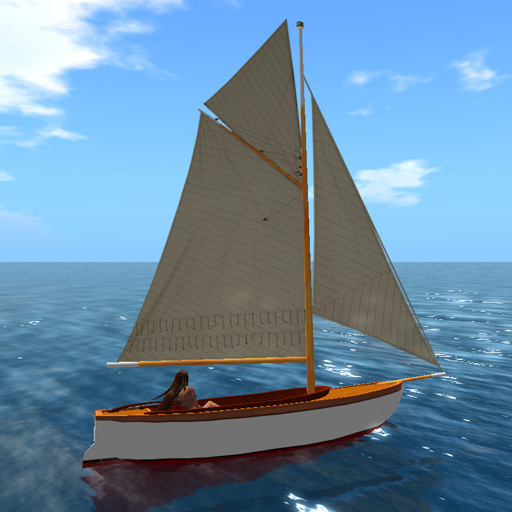 The Trudeau Sea Sharp (circa 2007, shown below) was our first attempt at building a 12 1/2 – like boat. Of course, working with the SL sphere and cylinder primitives at our disposal didn’t quite lend themselves to the compound curved beauty of the 12 1/2’s lines. It’s no surprise (to us, at least) that as soon as we had mastered a sculpty form beyond that of a hollowed out log, we would take another stab at the H12. That was the Trudeau Twenty (below left), our first sculpty boat. Closer perhaps, but still no cigar. 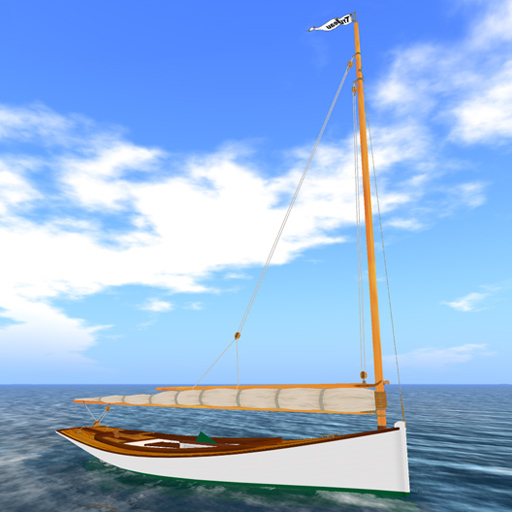 There are RL H12 owners in Second Life who directed comments our way on Twenty’s shortcomings as a Herreshoff H12 tribute. The masthead all wrong… the coamings are supposed to sweep all the way to the transom… the jib is supposed to self-tend on a club… and take those battens out of the main! Hey, when you are the owner of an important piece of yachting history and a bona-fide masterpiece, that entitles you to be picky! 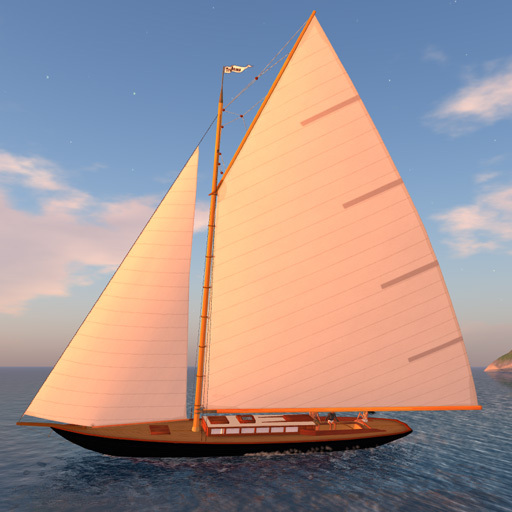 So now, over 4 years after Sea Sharp hit the seas, nearly 2 1/2 years after Twenty’s launch – those comments taken to heart, other lessons learned, new building skills acquired, additional Linden scripting functions to abuse, led us to take 3 of our infatuation with the H12. Since it is more or less 12 feet on the SL waterline, we decided to call this one a twelve as well. We think we nailed it this time! 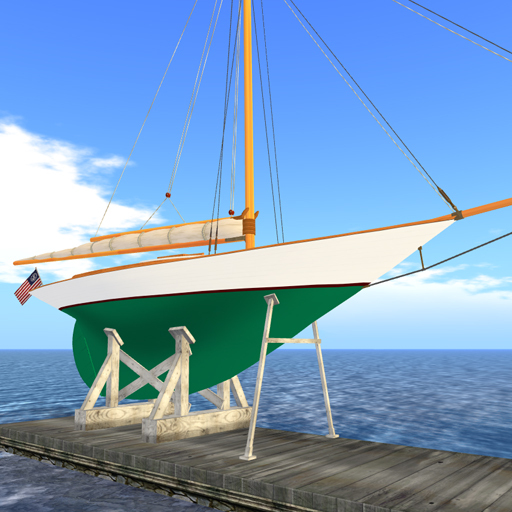 Though that makes it somewhat smaller than Twenty, the T12 can still haul you and 3 of your friends on sailing excursions throughout SL’s waterways. All four of those seated positions help counteract Twelve’s heeling – by shifting from side to side. There are tons – tons – of other new features. 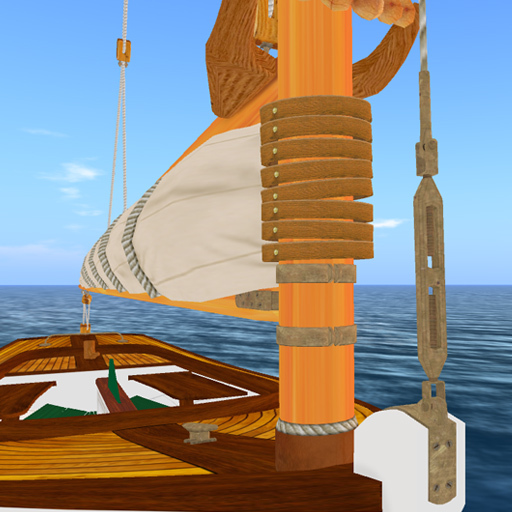 Beautiful sculpted gaff mainsail and jib with just the right billow and twist to bring a tear to an old salt’s eye (thanks to the very talented Bunnie Mills – give it up for her… again!). Our exclusive Tru-Sail feature as first introduced on the Trudeau One. 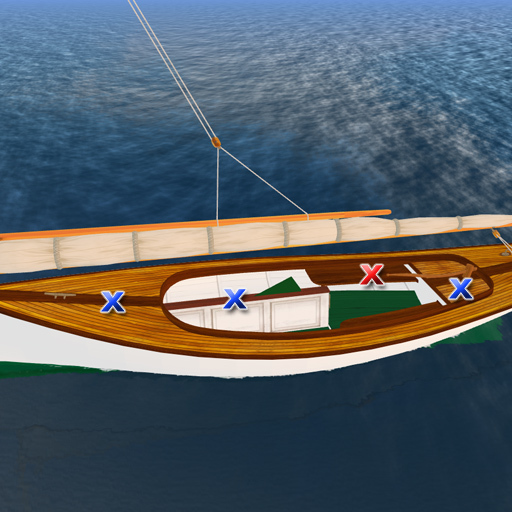 The sails flap, luff and fill to give inworld visual indication of correct sail set. 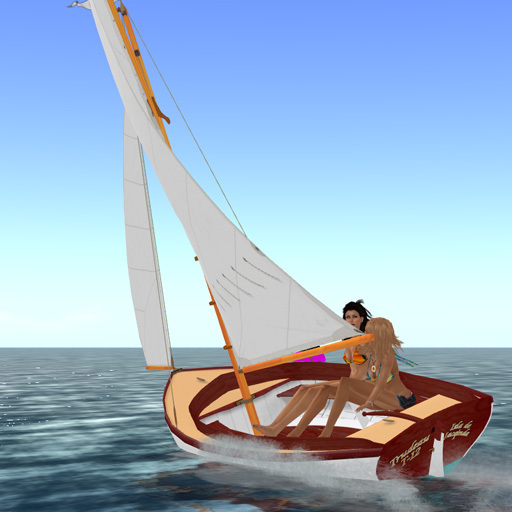 No HUD angle sail by numbers… no color codes… no big inworld dials… just realistic true to life sail behavior. Alright already … this is getting to sound a lot like our write up for the Leetle Cat II. We suggest you read about the features of the “new” Trudeau boats, including T12, there. 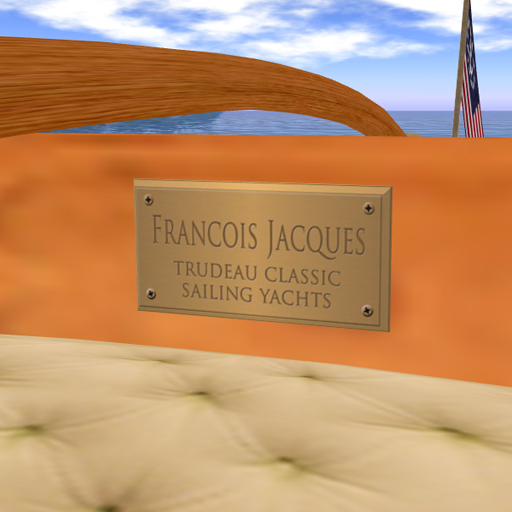 As you might have noticed about Trudeau boats, some boats have some features, other boats have other features. 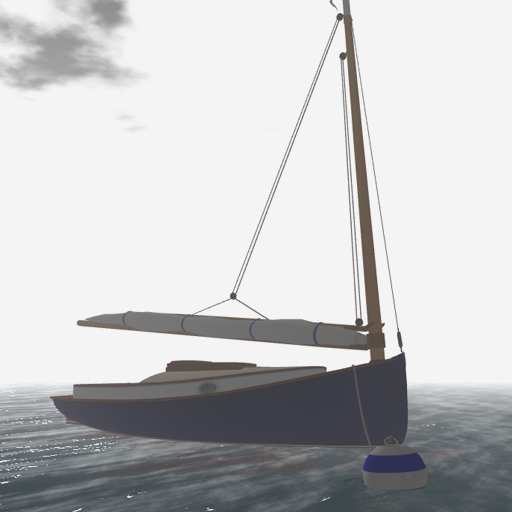 We try to give each of our boats a flavor of the RL ones they are modeled on. Here are some features unique to the T12. While she doesn’t have the spinnaker (not exactly standard equipment on the H12 when first introduced in 1914), she has a very effective wing and wing setting for running downwind. 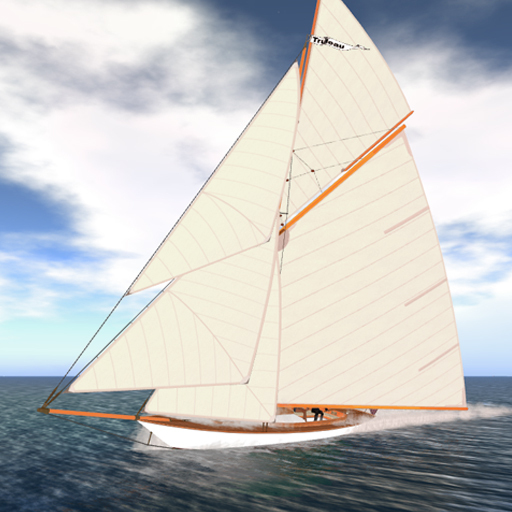 T12 is the replacement for the Twenty in our lineup, as such we have kept and updated popular features from that boat. For the cruising set is the motor and the boom tent and sleeping accommodations. 18ft (5.5m) LOA, 6.5ft (2m) beam, 2.6ft (.79m) draft. Come see the new Trudeau 12 at Trudeau Classic Sailing Yachts.